It was about this time last year I took my third graders outside for a paper airplane competition. We had spent a half hour working in teams to build various airplanes, and then we brought our fleets outside. The windy conditions made it a little tough, and my overly complicated rules and regulations for each round dragged out the whole experience a bit too long, but all in all, we had fun together. In the first round, you will assign a target, like a pole or a tree, and a spot from which to throw. I suggest about 10 steps or so between the throwing spot and the target. One member from each team will throw a plane, with the goal being to land it as close to the target as possible. In the second round, you need a stopwatch (I use the one on my i-Phone). One member from each team will throw a plane while you time how long it stays in the air, with the goal being to fly as long as possible. It makes no difference where the planes land, only how much time they stay airborne. In the third round, you will choose a straight path of some sort, like a sidewalk or curb, and a starting point along the path. One member from each team will throw a plane along the path, with the goal being to land the plane as close to the middle of the path as possible. It makes no difference how far the planes travel, only how accurate they are in relation to the path. Agree upon an acceptable minimum distance for a throw to count so that students don't simply drop the plane on the path. In the final round, find a nice open area and assign a starting spot. One member from each team will throw a plane, with the goal being for the plane to fly as far as possible. 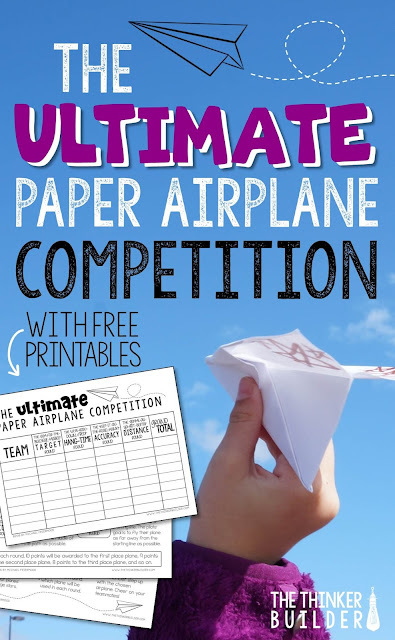 For paper airplane websites with free tutorials, tips, and printables, try THIS or THIS. For a video tutorial with no ads, try THIS. For blog posts with easy paper airplane instructions, try THIS or THIS. For pins with easy-to-follow instructions, try THIS or THIS. I like to provide each team with some printed instructions, and then show some short tutorials on the big screen as another option. Tell students that as a team, they will need to make at least four airplanes, one to fly in each round. I suggest making more than four to bring outside to practice with, and then choose the best four for the competition. The keys during the building phase are to work as a team and to work carefully and precisely. Make sure each team marks the wings of their planes with big stars of their assigned color. I like to give a gallon-size Zip-loc bag to each team to store their finished planes. Decide which plane they will use in each round. Decide which team member will be the "pilot" for each round. You might also want to show them how to make some basic wing adjustments: curling the wing tips up will cause the plane to turn upward; curling the wing tips down will cause the plane to turn downward. So, if a plane continually takes a nose dive into the ground, curling the wing tips up slightly can correct this problem. Students can experiment with other adjustments too, including how hard to throw the plane: some planes fly better with a less aggressive launch. After some time to practice, give students a two-minute warning so they can come together and make their final decisions with their teammates. Have them store the planes that didn't "make the cut" in their bag. When you are ready to start the competition, remind the whole class to stay positive, especially with their own team. There are going to be some unexpected flight patterns, but remember that everybody is trying their best and to have fun and enjoy the experience! Have each team send up their "round one pilot" to the starting spot. One at a time, they'll throw their designated airplane. Afterward, use the scoring sheet to record the points for the round: give 10 points to the first place throw, 9 points to second place throw, 8 points to third, and so on. Then have teams go collect their plane and prepare for the next round. If you want, you could also add some "bonus point" categories, like: best accidental trick in the air, or best looking plane, or best teamwork, or best sportsmanship. For example, I like to give bonus points if a team got last place in every round. At the end of the competition, add up the points to find out the champions! Get ALL the forms (the score sheet, the round explanations, and competition overview), the whole sha-bang, when you sign up for my free email newsletter below. I love doing teamwork activities, like the paper airplane competition, towards the end of the school year. I have lots more fun and fresh activities for the end of the year, too! Like in the one below, students write and design their own inspirational quote, and then we combine them into a "Inspirational Quote Quilt" to hang up to inspire next year's new crop of students. Or below, students create a scroll of "The ABCs of Third Grade" (or whichever grade you are in), or make a brochure for "How to Succeed in Third Grade." There are lots more activities included in pack one and pack two, designed for grades 3-5, like the Song and Dance of Learning activity (it's my personal favorite), Summer Goals flap book, "My Future" poem and portraits, Re-Deign the Classroom activity, and End of the Year Newscast. 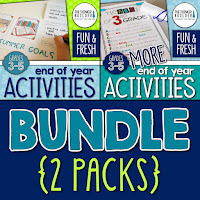 You can get all 12 activities in my End of Year Activities Bundle, shown to the right.